The album’s opening track, ‘Alba’, bathes the listener in a warm glow of vibes and electric piano with a groove evoking the laid back soul jazz of classic Ramsey Lewis Trio. Horns build up as the track lopes along, adding a punchy rawness to the languid head nodding slo-mo funk. A change of gear as ‘Samba Costanera’ briefly jacks up the pace with an opening of vivid, jarring stabs of piano and cymbal before dropping into a mid tempo beat with descending vibe motif. A bluesy tenor rides on top while the drummer keeps the beat tight and tidy before an outro of rapid electric piano trills and cymbal splashes. We leave as we entered. ‘Jenny’, a lush ballad, calms things down, as brushes gently skit on the drums, the vibes lap over the ears and the sax blows blue and mellow. ‘Paquito’ is another ballad on the album that demonstrates the range of the group, starting out somewhat impressionistic before a light samba rhythm takes charge and gently leads to track to its fade out. A cover of the classic Herbie Hancock ‘Maiden Voyage’ is a workout for the vibes once more. I am reminded of the late Bobby Hutchinson, yet this version is definitely Aquila’s own; electric piano gently accent the arrangement and the sax solo adds colour and texture to this glorious standard. ‘Providencia 12 Hrs’ keeps the rhythm section busy once more with dreamy vibes, pliant bass and fizzing cymbals along with ever insistent drumming that takes the track into a sudden beboppish section replete with walking bass and swinging vibes. 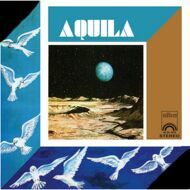 With the breakneck ‘El Viaje’, Aquila prove they can swing. It’s taken at a brisk pace, the bass working hard as the sax tears up the first solo before the vibes attack. Veering towards free in places, they keep it together enough to hold down a powerful and coherent groove. The album ends with their second cover version. This time, it’s their interpretation of Pharaoh Sanders’ ‘Um Allah’. Built around a powerful opening bass figure, the classic Sanders motif is instantly recognisable yet they do not try to be a carbon copy. Instead, they use Sanders and springboard for their own abilities. The vibes the centre stage here in the opening solo, colourful runs give space and depth to the sound before the horns enter and the band unite once more before the fade out.